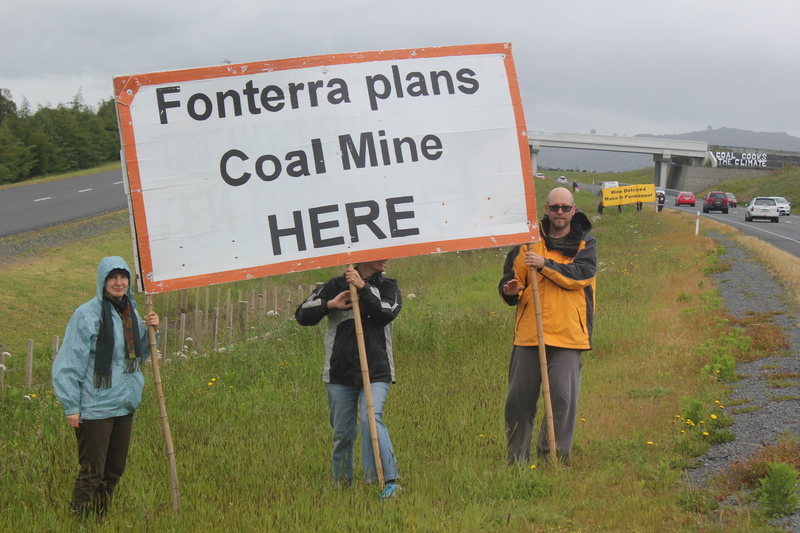 Fonterra’s new coal mine at Mangatawhiri is more than a year behind schedule and Auckland Coal Action has heard that Fonterra may further defer opening it. 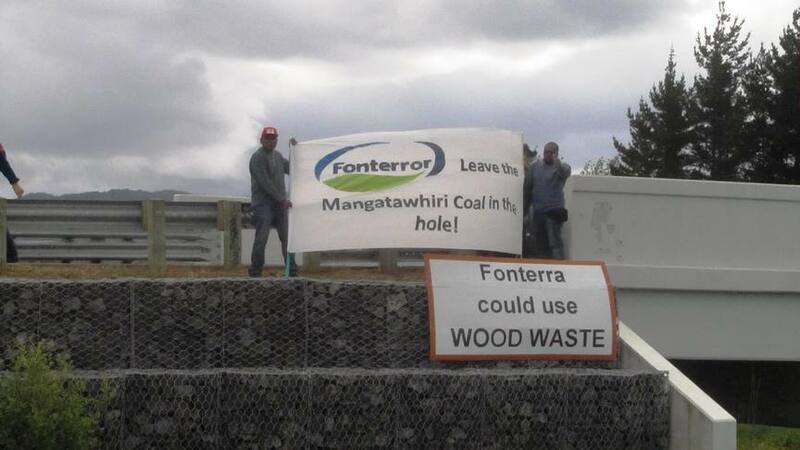 While Auckland Coal Action welcomes the deferral, we say Fonterra should make it permanent and start switching their boilers to renewable, environmentally-friendly biomass sources such as wood waste. 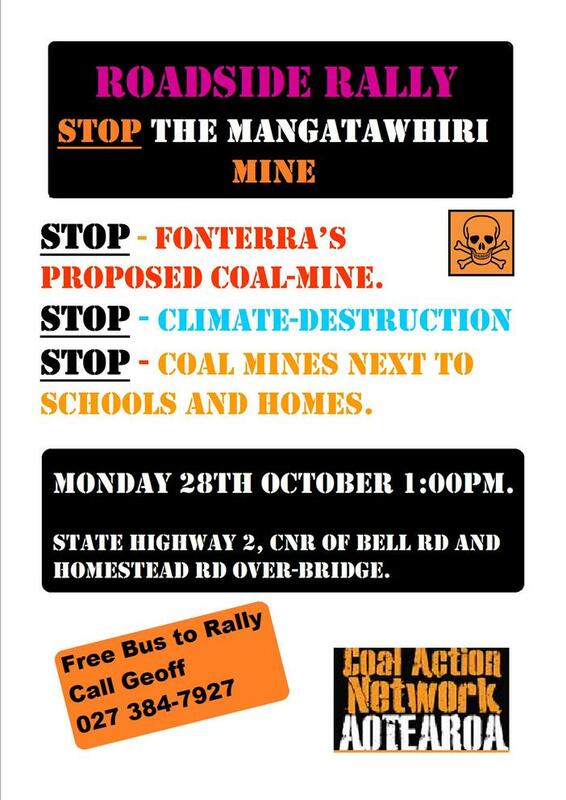 This Labour Weekend Monday we will be back at Mangatawhiri (only 45 minutes from the CBD) to make thousands of motorists returning to Auckland aware of the mine and increase pressure on Fonterra to keep it closed and clean up their act. 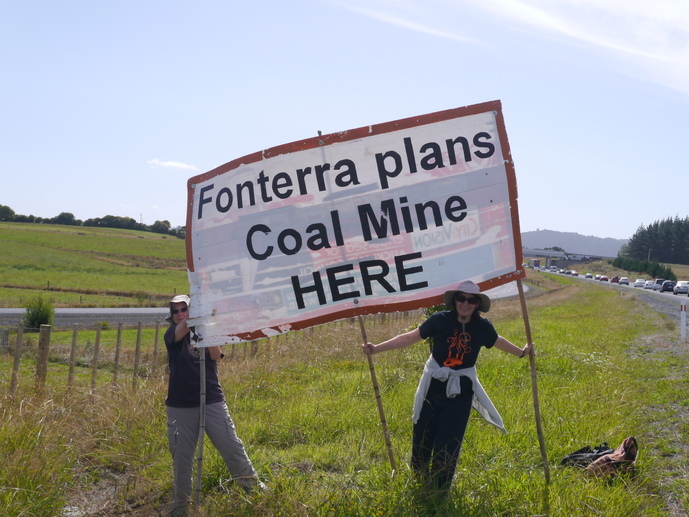 Meet for a roadside rally against Fonterra’s proposed new coal mine. 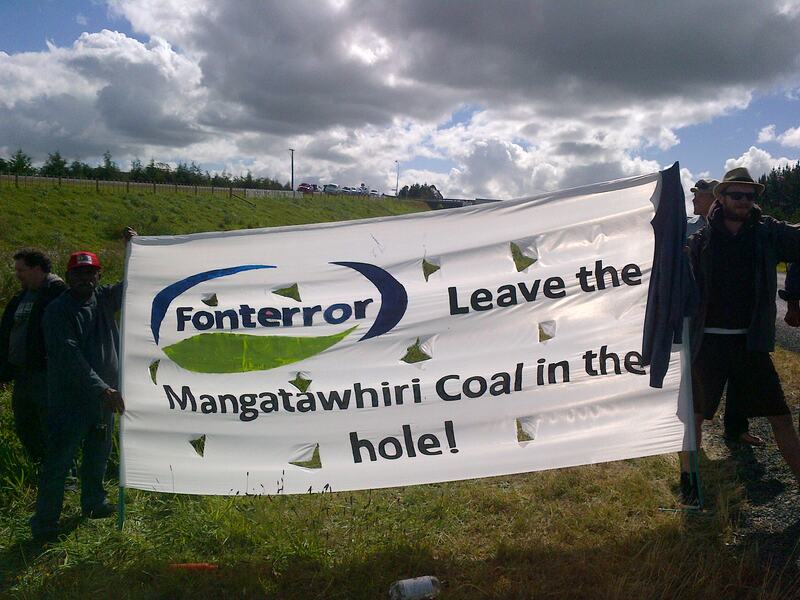 Auckland Coal Action is calling for the public to join us to rally to protest Fonterra’s proposed new coal mine. 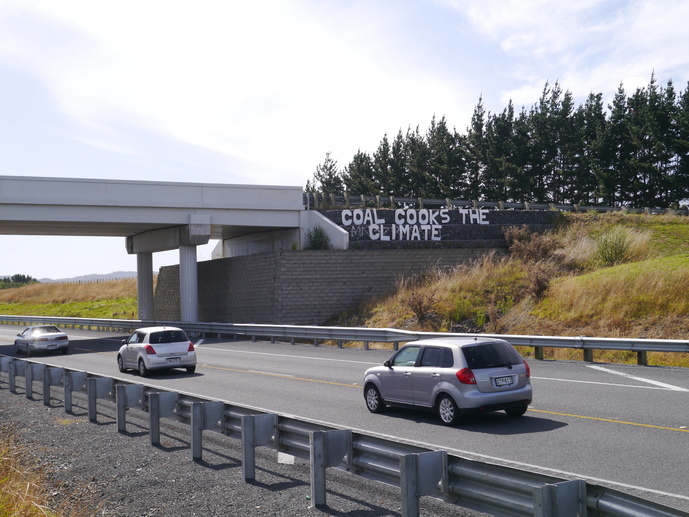 On the Auckland-bound side of State Highway 2 next to the site of the proposed new coal mine on the Mangatawhiri straight. 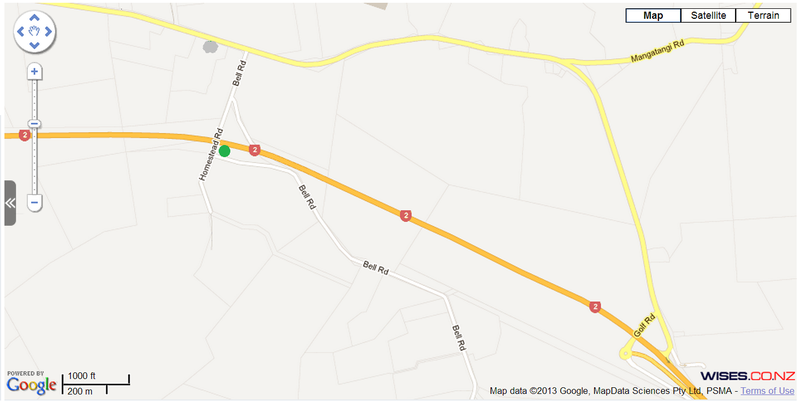 Meet after 2pm for roadside protest at the corner of Homestead Road (motorway overbridge) and Bell Road. Coming from Auckland you will need to take the Mangatawhiri exit from State Highway 2 onto Mangatawhiri Road (incorrectly shown as Mangatangi Rd on Google Maps). Coming from East, you will need to take the Golf Road exit. Sunblock, something to drink, rain gear and warm clothes. Check this website for updates. We have heaps of large banners for you to hold up. There will be lots of returning holiday crowds for you to interact with, Bored out of their minds sitting in the traffic and interested by anything you do, to bring attention to the danger of coal to the environment. Yes. If you are returning from your holiday why not stop and join the rally? You will only be stuck in traffic anyway! 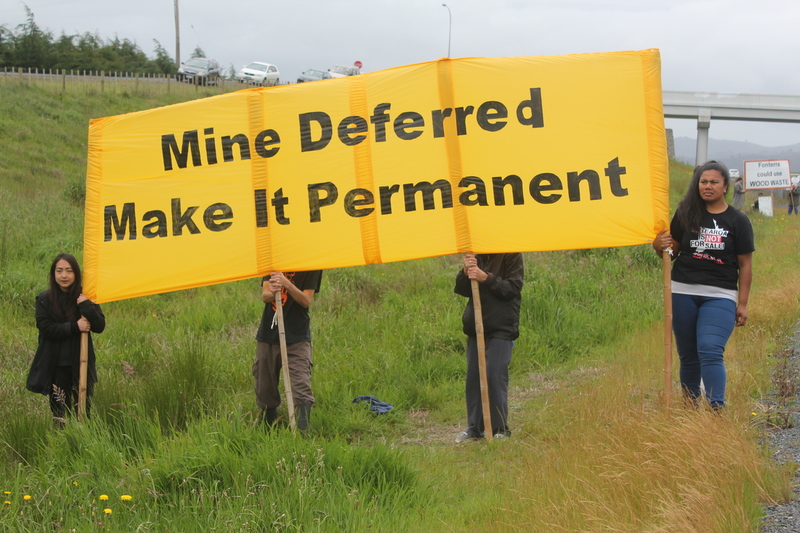 Support the campaign against new coal mines! Contact Pat 021 066-9009 or Geoff (09)5289450 for carpooling / transport options. Looking for something fun, worthwhile, altruistic, artistically creative, and political, to do on the last day of Labour Weekend? Undecided what to do? Sad at the damage climate change is doing to our world? Following on from our highly successful protests at Easter, Queens Birthday Weekend and Labour Day seen by thousands of vehicles, we are returning to Mangatawhiri for an encore. Why not join the fight against the number one preventable cause of global greenhouse gas emissions, coal? 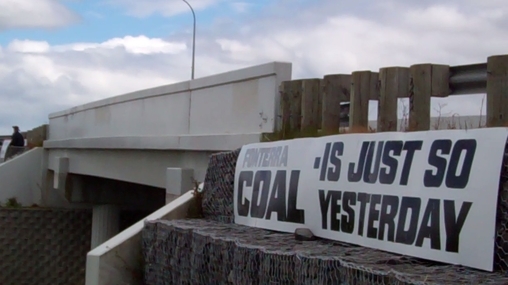 Auckland Coal Action is calling for the public to rally to protest Fonterra’s proposed new coal mine. Meet after 3pm for roadside protest at the corner of Homestead Road (motorway overbridge) and Bell Road. 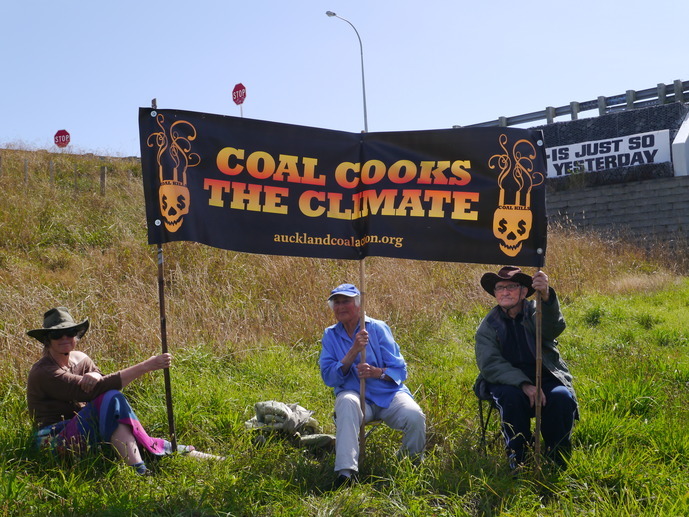 Auckland Coal Action’s Labour Day protest against Fonterra’s proposed new mine at Mangatawhiri was well attended, with almost 30 protestors seen by thousands of cars. 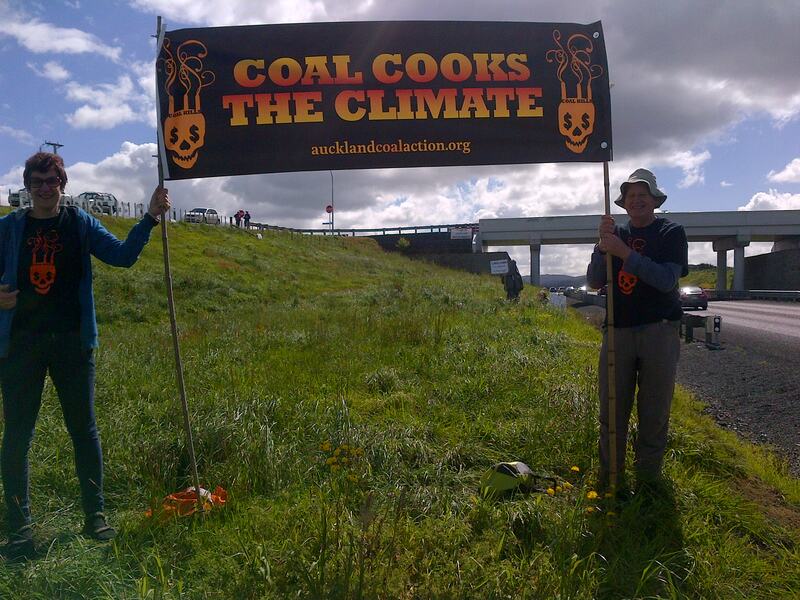 Aucklanders returning home from the long weekend got the message loud and clear: no new coal mines! 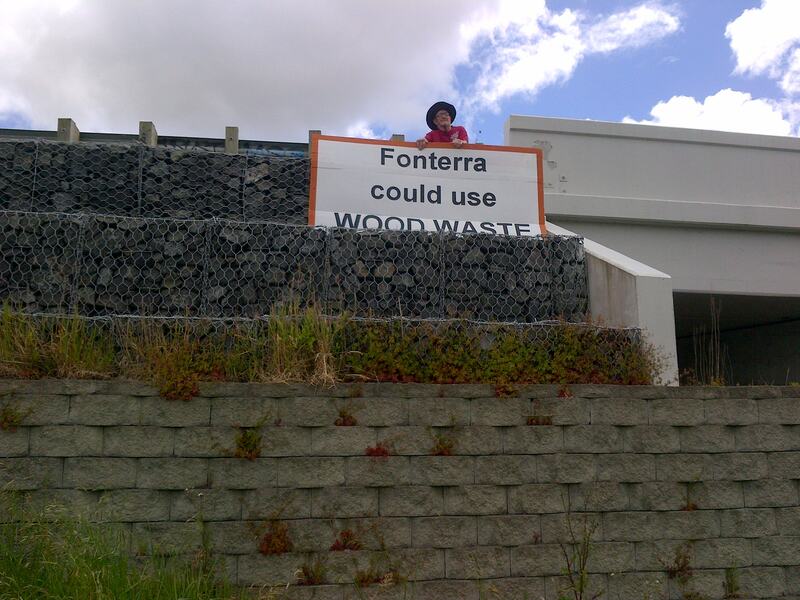 Fonterra must switch to wood waste ASAP ! 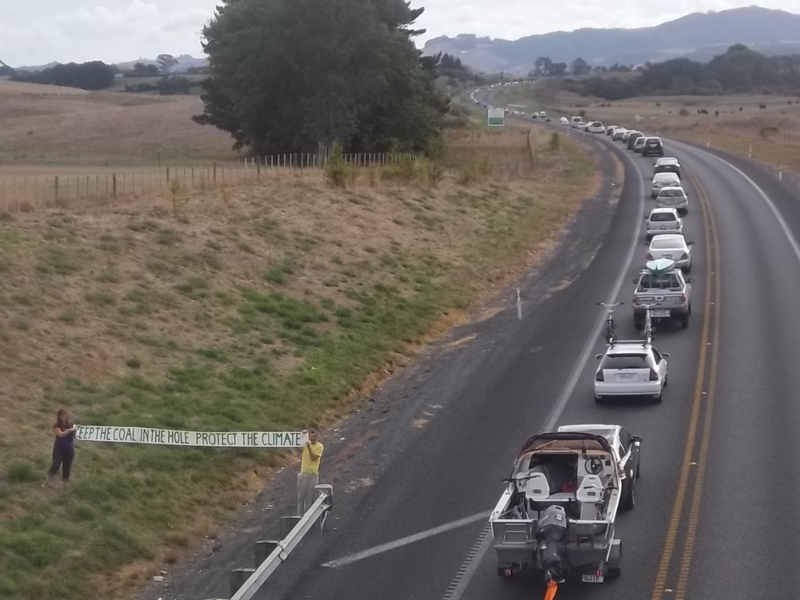 Following on from our highly successful protests at Easter and Queens Birthday Weekend seen by around 2000 vehicles, we are returning to Mangatawhiri for an encore. Why not join the fight against the number 1 preventable cause of global greenhouse gas emissions, coal? 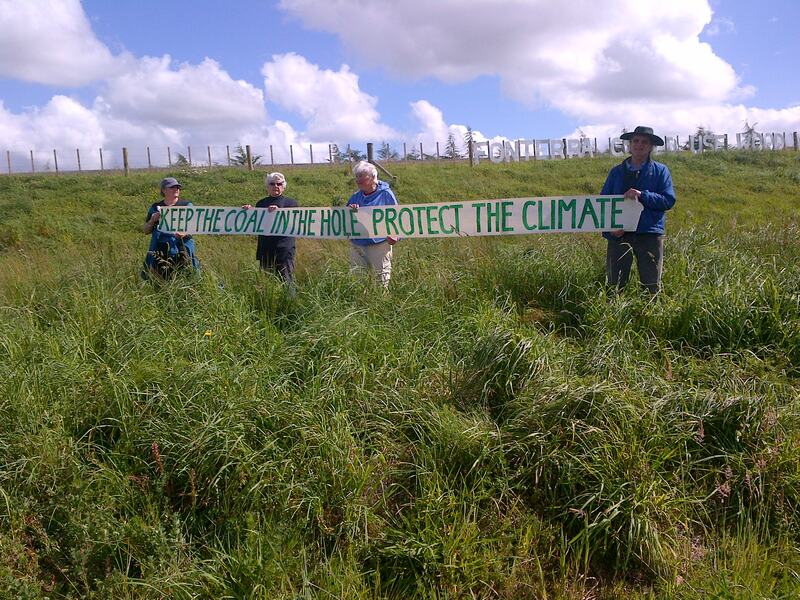 Meet after 1pm for roadside protest at the corner of Homestead Road (motorway overbridge) and Bell Road. 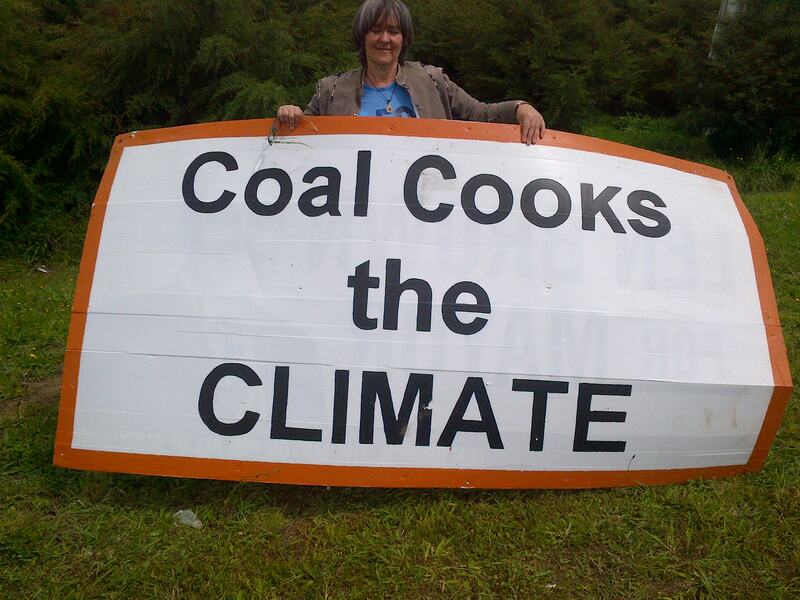 Bring your own banners and signs stating your opposition to climate change, and coal mining. Warm clothing is advised. 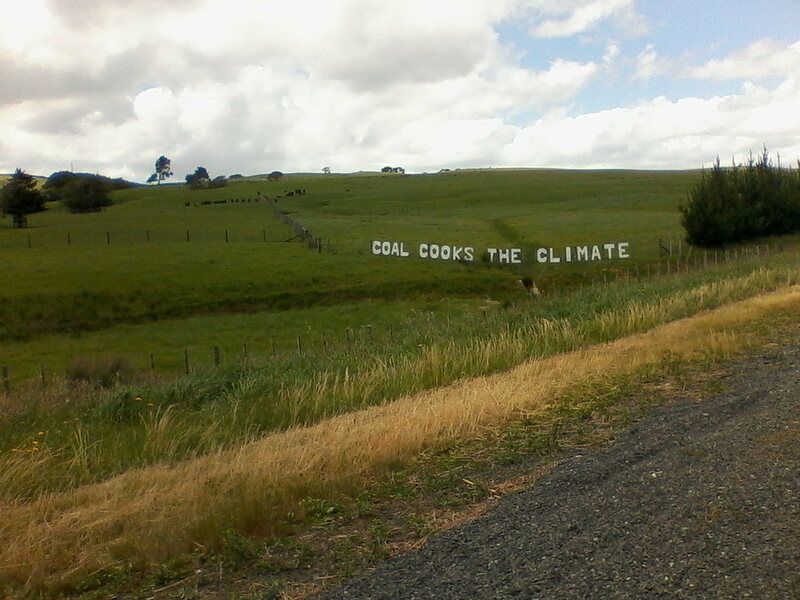 Or, invent your very own personal climate change message to present to the public and Fonterra.